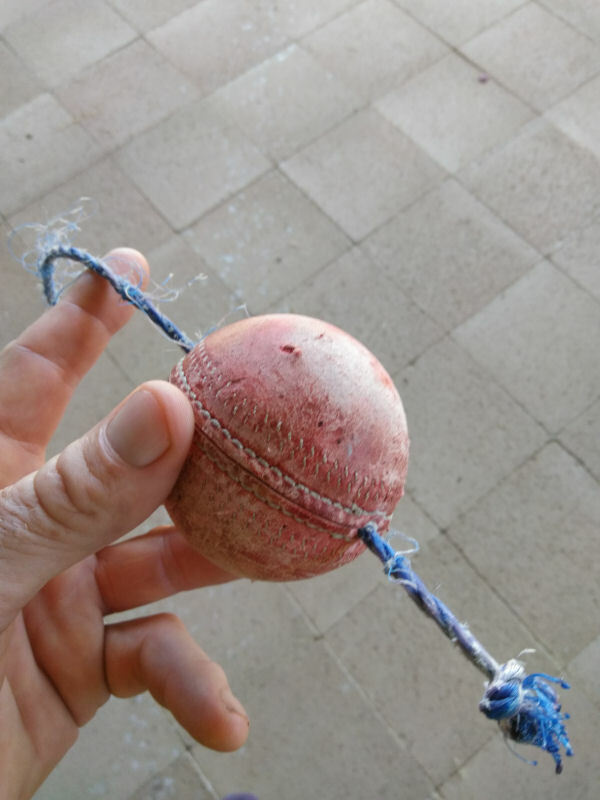 Mentioned on here a few months ago about the tennis ball on string method. Ultra-high-tech but it’s quite a fun little exercise if you have the space. I filmed myself doing some in my kitchen yesterday and thought I’d put it on here for criticism (hopefully constructive!). I feel like this kind of drill will help my hand speed and help me identify where I’m going wrong with my technique, so it would be great if any of you fine cricketers have any feedback. This is the first time I’ve filmed myself/seen myself bat so it was an interesting exercise! I know what I’m setting up tonight then...! It's a great practice-bodge! Tennis balls are cheap and I just used a length of rope. Can tie knots in it to make it longer to practice balls that keep low and shorter for short stuff. Put cricket ball in sock and try if that works. As you wont see ball so not sure how that will be different to actual seeing red ball coming at you. Another thing I will say is that you can put stumps behind you so you know where take guard. Stumps is a great idea! Always a fan of learning from them! Anybody got any tips on technique? Had my first Friday net last week and have to say I felt pretty good. Still a few loose shots but I think that's a lot of the point of net batting! Got some good comments about my on-drive and playing with a straight bat which is a big improvement from last season. An old post I know, but I thought I'd share some experiences. I've been using homemade ones for many years. Initial design of my Dad's was a wire loop through the seam for the rope to tie on, but only do this with an old bat, as the wire will mark the bat if you make contact. Current and better design is (hopefully) pictured below. Find some rope - about 6mm dia is plenty, and drill a 10mm hole through an old ball. It pays to drill 20mm deep 1/2" hole at the bottom, so you can recess the knot and it can't possibly damage the bat. It can be difficult threading the rope through if the hole isn't big enough or the rope is limp or frayed. Thread some cotton through, and tie it to the rope and pull through if having difficulties. Then tie a knot it the bottom and you're done. It's good for getting the kids to practice straight bat shots, getting their front foot to the pitch of the ball, or stepping inside a leg glance. Not so much for back foot stuff as the angles are wrong for keeping the arc smooth, and any kind of shot results in a 'helicopter' ball, so I hang the ball at more of a driving length. As for technique, I'd tell you (as I do with my kids) to practice a good step forward, then step all the way back to your starting batting stance, side on before the next ball. Don't go half a step forward and then stay there, shuffling your front foot left and right - fully commit to each shot. Also try to point the front foot down the wicket each time, rather than across it at 45 degrees. This will form good habits, and before you know it you'll have automatic front foot shots with no gap between bat/pad. If you can do it outside, the higher you can hang the rope, the faster the ball will come. And finally, remember it's a tool best suited for practicing correct footwork, and not for seeing how hard you can hit. People get angry when they hear the ball slamming into the roof or other objects! Page created in 0.443 seconds with 37 queries.